Die vorliegende Publikation bietet einen fundierten Überblick über die insgesamt achtzehn Musikhandschriften des Supplementum graecum der Österreichischen Nationalbibliothek. Diese Codices sind deshalb von großer Bedeutung für die Forschung, da ihre Entstehungszeit einen Zeitraum vom 15. bis zum 19. Jahrhundert abdeckt. Darüber hinaus zeichnet sie eine Vielfalt an Notationsformen, musikalischen Traditionen, Gesangsgattungen und Komponisten aus. Anhand dieser Codices lässt sich somit die Evolution der musikliturgischen Bücher rekonstruieren, wie auch die unterschiedlichen Kompositionsstile und die einzelnen Entwicklungsstufen der Notenschrift bis hin zur Reform von 1814. Der erste Teil des Buches bringt einen Überblick über die einzelnen Handschriften, ihren Aufbau und ihr Repertoire, während sich der zweite der Meloden und ihren biographischen Details widmet. Im Mittelpunkt der Arbeit steht im dritten Teil die Analyse ausgewählter Gesangsgattungen, wie jene des Anastasimatarion, der elf Heothina sowie der Cherubika. Den Abschluss bildet ein spezielles Kapitel über die sogenannte „Papadike“, die als eine Art kurze Einführung in die byzantinische Notation vielen der Handschriften vorangestellt ist. Abgerundet wird die Publikation durch ein detailliertes Verzeichnis der über 1600 verschiedenen Gesänge und ihrer Komponisten, sowie durch einen ausführlichen Tafelteil. 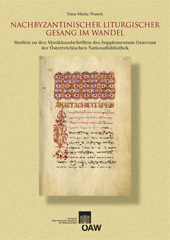 The publication gives a detailed overview over the eighteen liturgical manuscripts of the "Supplementum graecum" at the Austrian National Library. These manuscripts are of great interest for the research of music in general as they date from 12th to the 19th centuries. They contain a great variety of notational practices, musical traditions, genres and composers. With the help of these manuscripts not only the evolution of music liturgical books can be reconstructed but also the compositional styles and the various stages of development of the different notations until the reform of 1814 can be traced. The first part of the book contains the overview over the individual manuscripts, their structure and their repertoire, whereas the second part is dedicated to the composers and their biographical details. The third and central part of the book brings analyses of selected genres, such as the "Anastasimatarion", the eleven "Heothina" and the "Cherubika". A special chapter deals with the so-called "Papadike" – a sort of short introduction to Byzantine notation, which can be found at the beginning of most of the manuscripts. The publication also includes a detailed register of the more than 1600 chants and their composers, as well as colour plates of parts of the manuscripts.